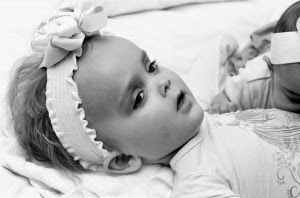 Tay Sachs disease is a type of degenerating neurological disease caused by a deficiency of the enzyme protein hexosaminidase A. Because the enzyme is deficient, a lipid molecule called GM2 ganglioside builds up inside the lysosomes of cells. It's for this reason that doctors categorize it as a type of lysosomal storage disease. 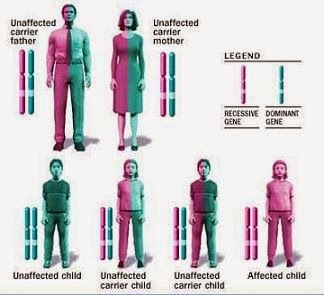 The disease occurs when parents that are BOTH carriers of the genetic mutation have a baby. The most common carriers are Ashkenazi Jews, French Canadians and Louisiana Cajuns (1 in every 27), though carrier frequencies are also high in Irish Americans (1 in 50) and the general population (1 in 250). The disease typically occurs acutely in infancy, but there are three documented presentations: acute, subacute and late onset. The classic presentation, the acute (infantile) form, involves progressive motor weakness with loss of milestones and myoclonic jerking beginning at 3 months of age. 98% of patients develop seizures, and death typically occurs within the first few years of life. The severity is due a complete absence of the hexosaminidase A enzyme. The subacute (juvenile) form will present as late as 9 years old, and is characterized by seizures, choreiform movements, speech problems and incontinence. These children will typically develop dementia and won't live past the teenage years. Late onset Tay Sachs (LOTS, adult) cases have been reported in older patients, and usually involve subtle disturbances in speech, mood and psychological state. Pediatricians should suspect Tay Sachs Disease in any Jewish patient or patient of Jewish descent with delayed milestones and myoclonic jerks before the age of 1. 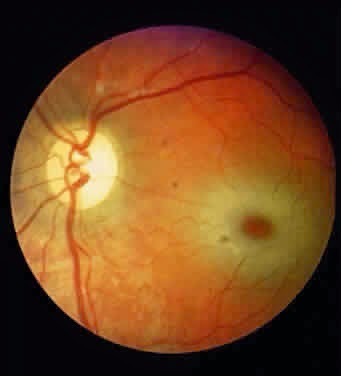 Close inspection of the eye will typically reveal a cherry-red colored spot on the macula of the retina, which is only present in a few childhood diseases (Krabbe, Canavan, Alexander, and Gaucher diseases). A blood test will officially confirm the diagnosis. Management of the disease involves maintaining nutrition, respiratory function and motor function while minimizing infectious diseases and seizures. Later forms benefit from both speech and physical therapies. All patients and their families should be referred to a certified genetic counselor for counseling. The prognosis for Tay Sachs disease is very poor. One retrospective study followed 97 infants diagnosed with Tay Sachs disease and noted that death occurs before the age of 5 in nearly all patients. 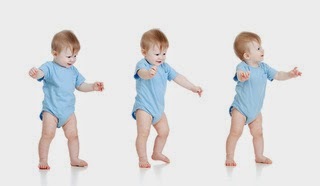 Milestones such as head control, transferring objects from hand to hand and sitting without suport were acheived by the babies in over half the cases, but all lost their abilities by 1 year of age. The median lifespan of the infants was only 47 months. Tay Sachs Disease. Dynamed Database. Updated May 12 2014. Accessed July 10, 2014. "Is my child developing normally?" This question is almost guaranteed during nearly all well child encounters in the pediatric office setting. Parents, rightfully so, are commonly concerned about their child's development and need a small amount of reassurance from their professional caregiver. What are the guidelines that all pediatricians follow? The pediatrician references a set list of known guidelines when evaluating the development of a child. 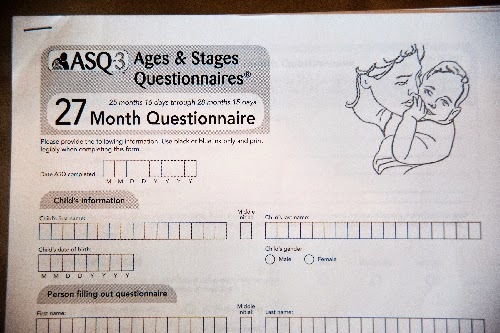 He or she often does this in three ways: using an Ages and Stages Questionnaire (sensitivity 75%, specificity 81%) filled out by the parent, asking the parent specific questions about the child and physically examining or interviewing the child. 1) The milestones are simply a guide: physicians use it to help determine if a child has fallen below normal when compared to other age-matched children. It is the job of the pediatrician to recognize a child that has fallen behind in one area and to offer support or resources to help him or her catch up (i.e, the Early Steps program). 2) All children develop differently. One child may meet all milestones on time while another may be persistently behind in one area. It's important to always be patient with (and supportive of) your child. Developmental Milestones. Dynamed Database. Updated March 27, 2014. Accessed July 7, 2014. 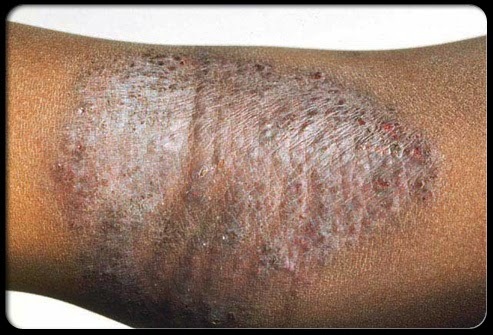 Eczema (atopic dermatitis) is a chronic condition caused by inflammation of the skin. It's a component of the "atopic march" which includes asthma, hay fever, and food allergy. Though the exact cause is unknown, the risk of developing eczema is higher in children with dry skin (xerosis) and those with immune dysfunction. Eczema is most common in children younger than 5 years old. Studies show that 66% of patients first experienced eczema before 7 years of age. The amount of children affected by eczema varies by country and, in the United States, from state to state. Numbers reported are from 1 to as high as 22% of children younger than 18. Studies also show that preterm infants (<37 weeks gestation at birth) have a higher risk of developing the condition. Possible risk factors include atopy (positive reaction to at least one skin prick allergen), not breast feeding, immunosuppressants and stress. Children with eczema are at an increased risk of skin infections caused by staph, strep, herpes simplex 1 and various fungi. Chronic itching may lead to scarring and sleep disturbances. 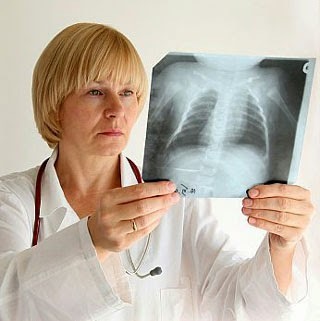 The pediatrician will make the diagnosis based on physical examination. It's important to rule out conditions such as parasitic infections (scabies), fungal infections (tinea), metabolic conditions (zinc deficiency), immunological deficiencies (Wiskott-Aldrich Syndrome, dermatitis herpetiformis, lupus, HIV dermatitis), systemic disease (primary biliary cirrhosis, polycythemia vera and renal failure) and other skin conditions (contact dermatitis, ichthyosis, psoriasis and seborrheic dermatitis). Most cases of childhood eczema improve with age, and up to 70% of cases clear by teenage years. An anti-inflammatory (steroid cream such as triamcinolone) may be prescribed. Use twice a day. Atopic dermatitis. Dynamed database. Updated January 21 2014. Accessed July 2, 2014. Asthma is a condition of the small airways of our lungs in which hypersensitive cells are aggravated by environmental substances, leading to inflammation, swelling and poor air flow. It is estimated that 70% of cases are caused by allergic substances such as dust, pollen and pet dander. Other causes include viral illnesses, exercise and cough. It’s estimated that in the United States, 1 in 10 children younger than 18 years suffer from asthma. Many children with asthma have experienced what is known in dermatology as the “atopic march”, which is essentially a trifecta of asthma, atopic dermatitis (eczema), food allergy and allergic rhinitis (hay fever). Additionally, having asthma makes airways of children vulnerable, putting them at increased risk for diseases like pneumonia, influenza and obstructive sleep apnea. 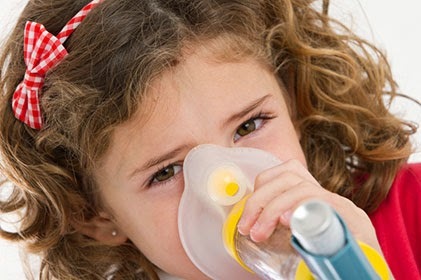 Signs of asthma in children younger than 2 years old include noisy breathing, grunting and cough while the classic signs in children with are wheezing, chest tightness, cough and difficulty breathing. Pediatricians will attempt to get specific information regarding the asthma in order to both determine the level of severity and prescribe the most appropriate course of treatment. Questions asked include daytime or nighttime cough, possible triggers (such as viral illness, changing seasons, exercise, etc) and previous episodes. This can reveal special cases such as cough-variant asthma and exercise-induced asthma. Additionally, the pediatrician will want to rule out other conditions such as viral bronchiolitis, cystic fibrosis (CF), bronchopulmonary dysplasia (scarring of the lungs in premature babies) and aspiration of a foreign body. Tests ordered may include spirometry in children >5 years old (blowing into a tube to test lung strength/capacity) and/or a sweat chloride test in children younger than 3 (to rule out CF). The treatment for asthma depends on the severity. All asthma patients, regardless of severity, are placed on a short-acting beta agonist (SABA, an inhaler) on an as needed (prn) basis. The child’s response to the treatment will be reassessed at follow up in 2-6 weeks. An oral corticosteroid, such as prednisone, may be added in very severe cases where the inhaled medication isn’t working well. The reason for this is that if the airways are severely blocked, the inhaled medication will not be able to reach the tissues to be absorbed. If a child experiencing an asthma exacerbation is not responding to his or her treatment, experiences a late night attack or has had a severe episode in the past, it’s important to bring them to the emergency room for monitoring. They may require endotracheal intubation, IV antibiotics and/or an IV theophylline drip. Asthma in Children. Dynamed Database. Updated May 7, 2014. Accessed July 1, 2014.